Seattle Reign FC outlasted Portland Thorns FC 3-2 on Saturday afternoon in front of a loud crowd of 16,054 at Providence Park in Portland, Oregon. The match was a return to Providence Park for Seattle Reign FC midfielder Allie Long, who played five seasons for the Thorns, and Reign goalkeeper Michelle Betos, who won the 2015 NWSL Goalkeeper of the Year as a member of the Thorns, as they played their first game vs. their former team. Both would have their moments in the game. Long nearly scored on a volley that she hit just high in the 41st minute. Betos made eight saves, including several late to keep Seattle in the lead. Rumi Utsugi scored the game-winner for Seattle Reign FC in the 75th minute. Nahomi Kawasumi played a short corner to Steph Catley, and after Kawasumi and Catley tradded passes, Catley passed to Utsugi, about 25 yards from goal. Utsugi took a touch around her defender and fired a strike that beat a diving Britt Eckerstrom to put Seattle ahead. With the result, the Reign are now 3-1-1 (10 points) and the Thorns are now 2-2-2 (8 points). Seattle opened up the scoring in the first half when Beverly Yanez headed in a Nahomi Kawasumi corner kick in the 36th minute. 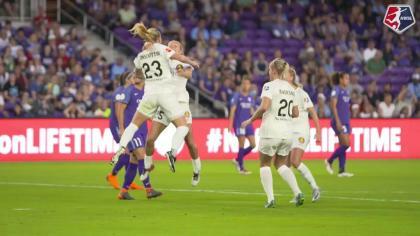 The match stayed scoreless until the 61st minute, and then became a wild back-and-forth affair, as the teams combined to score four goals in 14 minutes. Emily Sonnett scored after a Tobin Heath corner kick in the 61st minute to tie it 1-1. Heath and Andressinha subbed in at halftime for the Thorns and sparked Portland’s offense in the second half. The Reign took the lead again just three minutes later when Jodie Taylor converted a penalty kick for her second goal of the season. Ana-Maria Crnogorčević was called for a foul on Jess Fishlock to set up the penalty. 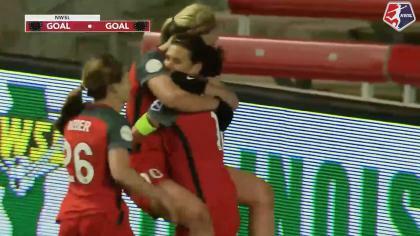 But six minutes after that, Lindsey Horan leveled the match 2-2, heading home a cross from Meghan Klingenberg. The match didn’t stay tied for long thanks to Utsugi’s strike. Portland kept pushing late, but Betos was up to the task. She made a point blank save on Heath in the 88th — and the follow-up shot was cleared off the line by Kristen McNabb. In the 89th minute, she made a huge diving save vs. a Horan header on one of Portland’s eight corner kicks in the match. The Thorns had the edge in most of the stats in he game, but were thwarted by Betos. They outshot the Reign 24-12 and 11-8 in shots on goal. They led in corner kicks 8-5 and in possession 53.6% to 46.4%. All the feels. @ALLIE_LONG catches up with @DalenCuff after @ReignFC's victory. The Thorns will next take on the Houston Dash on Wednesday. The Reign will host Sky Blue FC on Sunday, May 12. Match ends, Portland Thorns 2, Seattle Reign 3. Second Half ends, Portland Thorns 2, Seattle Reign 3. Attempt saved. Lindsey Horan (Portland Thorns) left footed shot from the left side of the box is saved in the bottom left corner. Assisted by Midge Purce with a headed pass. Attempt blocked. Lindsey Horan (Portland Thorns) right footed shot from the left side of the box is blocked. Assisted by Andressinha. Corner, Portland Thorns. Conceded by Maddie Bauer. Attempt saved. Lindsey Horan (Portland Thorns) header from the centre of the box is saved in the centre of the goal. Assisted by Tobin Heath with a cross. Attempt blocked. Tobin Heath (Portland Thorns) left footed shot from the left side of the six yard box is blocked. Attempt saved. Tobin Heath (Portland Thorns) left footed shot from the left side of the six yard box is saved in the bottom left corner. Assisted by Christine Sinclair with a headed pass. Alyssa Kleiner (Seattle Reign) is shown the yellow card. Attempt saved. Midge Purce (Portland Thorns) right footed shot from the right side of the box is saved in the bottom right corner. Assisted by Lindsey Horan. Attempt blocked. Lindsey Horan (Portland Thorns) left footed shot from the centre of the box is blocked. Assisted by Midge Purce. Attempt missed. Lindsey Horan (Portland Thorns) left footed shot from the right side of the box is close, but misses to the left. Assisted by Midge Purce. Substitution, Seattle Reign. Morgan Andrews replaces Jessica Fishlock. Goal! Portland Thorns 2, Seattle Reign 3. Rumi Utsugi (Seattle Reign) left footed shot from outside the box to the bottom right corner. Assisted by Stephanie Catley following a corner. Corner, Seattle Reign. Conceded by Kelli Hubly. Attempt blocked. Jodie Taylor (Seattle Reign) left footed shot from the centre of the box is blocked. Assisted by Jessica Fishlock. Substitution, Seattle Reign. Maddie Bauer replaces Christen Westphal. Attempt saved. Jodie Taylor (Seattle Reign) right footed shot from the centre of the box is saved in the top centre of the goal. Substitution, Seattle Reign. Alyssa Kleiner replaces Beverly Yanez. Goal! Portland Thorns 2, Seattle Reign 2. Lindsey Horan (Portland Thorns) header from the centre of the box to the bottom left corner. Assisted by Meghan Klingenberg with a cross. Attempt missed. Lindsey Horan (Portland Thorns) header from the right side of the six yard box misses to the left. Assisted by Meghan Klingenberg with a cross. Corner, Portland Thorns. Conceded by Kristen McNabb. Attempt blocked. Andressinha (Portland Thorns) right footed shot from the centre of the box is blocked. Goal! Portland Thorns 1, Seattle Reign 2. Jodie Taylor (Seattle Reign) converts the penalty with a right footed shot to the centre of the goal. Penalty Seattle Reign. Jessica Fishlock draws a foul in the penalty area. Penalty conceded by Ana Maria Crnogorcevic (Portland Thorns) after a foul in the penalty area. Attempt blocked. Beverly Yanez (Seattle Reign) left footed shot from the centre of the box is blocked. Assisted by Stephanie Catley with a cross. Nahomi Kawasumi (Seattle Reign) wins a free kick on the left wing. Goal! Portland Thorns 1, Seattle Reign 1. Emily Sonnett (Portland Thorns) right footed shot from very close range to the bottom right corner following a corner. Corner, Portland Thorns. Conceded by Michelle Betos. Attempt blocked. Ana Maria Crnogorcevic (Portland Thorns) right footed shot from the centre of the box is blocked. Assisted by Tobin Heath. Hand ball by Kelli Hubly (Portland Thorns). Attempt saved. Ana Maria Crnogorcevic (Portland Thorns) right footed shot from very close range is saved in the centre of the goal. Assisted by Lindsey Horan. 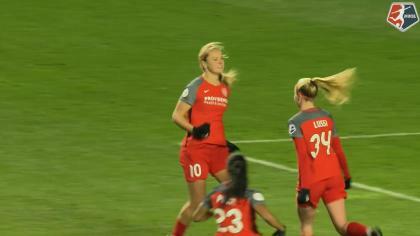 Lindsey Horan (Portland Thorns) hits the bar with a right footed shot from outside the box. Attempt missed. Tobin Heath (Portland Thorns) left footed shot from the left side of the box is close, but misses the top left corner. Assisted by Midge Purce with a cross. Attempt missed. Beverly Yanez (Seattle Reign) left footed shot from outside the box misses to the left. Assisted by Nahomi Kawasumi. Second Half begins Portland Thorns 0, Seattle Reign 1. Substitution, Portland Thorns. Tobin Heath replaces Mallory Weber. First Half ends, Portland Thorns 0, Seattle Reign 1. Attempt saved. Ana Maria Crnogorcevic (Portland Thorns) header from the centre of the box is saved in the centre of the goal. Assisted by Katherine Reynolds with a cross. Attempt missed. Allie Long (Seattle Reign) right footed shot from the centre of the box is just a bit too high. Assisted by Beverly Yanez with a cross. Attempt blocked. Mallory Weber (Portland Thorns) right footed shot from the left side of the box is blocked. Assisted by Ana Maria Crnogorcevic. Goal! Portland Thorns 0, Seattle Reign 1. Beverly Yanez (Seattle Reign) with an attempt from very close range to the top left corner. Assisted by Nahomi Kawasumi with a cross following a corner. Attempt saved. Jessica Fishlock (Seattle Reign) right footed shot from outside the box is saved in the bottom right corner. Corner, Seattle Reign. Conceded by Britt Eckerstrom. Attempt saved. Allie Long (Seattle Reign) header from the centre of the box is saved in the top centre of the goal. Assisted by Megan Oyster. Attempt missed. Ana Maria Crnogorcevic (Portland Thorns) right footed shot from the right side of the box misses to the right. Attempt saved. Mallory Weber (Portland Thorns) right footed shot from the centre of the box is saved in the bottom left corner. Assisted by Ana Maria Crnogorcevic with a headed pass. Attempt missed. Lindsey Horan (Portland Thorns) right footed shot from outside the box is too high from a direct free kick. Attempt saved. Stephanie Catley (Seattle Reign) left footed shot from the left side of the box is saved in the centre of the goal. Mallory Weber (Portland Thorns) hits the bar with a left footed shot from the centre of the box. Offside, Portland Thorns. Christine Sinclair tries a through ball, but Mallory Weber is caught offside. Attempt saved. Lindsey Horan (Portland Thorns) right footed shot from outside the box is saved in the bottom left corner. Assisted by Emily Sonnett.